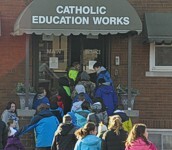 St. Mary's Catholic Grade School. We have educated children living in Woodford County; Metamora, Germantown Hills, Washburn, Eureka, and Roanoke areas for over 135 years. Students have many opportunities to participate in extracurricular activities from athletic activities to scholastic activities. We're loyal to you St. Mary's Grade. We're bright gold and blue, St. Mary's Grade. We want you to fight, With all of your might And we'll cheer you on to victory tonight! Rah! Rah! So let's do the most that we can To prove we're the best in the land. St. Mary's is our name, blue and gold is our fame Come on team fight to win the game! F-F-F-A-L-C-C-C-O-N! F-A-L-C-O-N! Falcons all the way!